1. It woks stablly with high precision. 2. The cutting speed is fast. 3. The margin of processed EPE foam sheets is smooth. 4. It works safely because operaters don’t need to be close to the hot knifes of this machine. Business Description: Zhuhai Huasu Automation Machinery Equipment Co., Ltd is a professional supplier of EPE foam deep processing machine,with our own brand VEINAS. Established in 2013, Zhuhai Huasu is located in beautiful costal city Zhuhai, covering an area of more than 5500 square meters. We have our own R&D team and we have gained a lot of patent certificates in this industry. We also have experienced sales team to provide the most professional service to our customers in both domestic and oversea market. 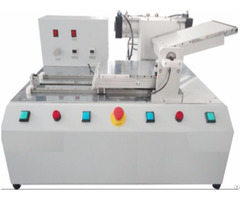 Our first product, the smokeless automatic bonding machine was officially put into market in June, 2014. By significantly increasing productivity and reducing labour cost, this machine has helped lots of companies make inestimable profit and therefore enjoys great popularity. Our current equipments are: EPE automatic bonding machine, EPE automatic bonding machine of two operating platform, EPE high speed cutting machine, EPE slitting machine, EPE frame bonding machine, EPE grooving machine, EPE automatic hot cutting machine, EPE waste discharging machine, EPE die cutting machine etc. We will always stick in providing excellent quality and professional service to our customers. Thank you for your attention and welcome to contact with us anytime anywhere.